I bought a set for myself and my son's car, arrived in a few days of ordering them very pleased with my order.good quality and fitted the cars very well.I would order from this company again and recommend them. No problem with the order fast and efficient.Easy to order. Product arrived in super quick time and was quick and easy to fit ! The mats were a perfect fit for my car and look good quality. Fab delivery speed, vibrant cool product. Love the choice of colours and trims. Impressive number of combinations available. Absolutely love the look of the product. Pleasantly surprised by how quickly they arrived. I just wanted to say that I am extremely pleased with the car mats that arrived very quickly. I ordered late afternoon on Monday and they arrived on Wednesday. I was amazed at how well they fit every curve of the footwell. They were mats for a Dacia sandero stepway. 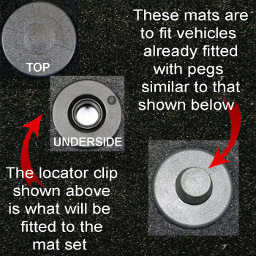 Click the button below to add the Dacia Sandero Stepway (2013 to Current) Tailored Car Mats (2 Round Clips) to your wish list.